Dr. Henne focus exclusively on providing you with outstanding results by utilizing innovative technology to optimize your care, and are dedicated to restoring and improving the appearance, self-esteem, and quality of life of their patients from all of Florida. We offer our laser for $100 per session, which is one session that takes about 15 minutes to perform. Making an appointment with the doctor is the first step to help start to battle your fungus! Call Now to see one of our great doctors! Toenail fungus can be embarrassing, annoying and even painful. At the Center for Ankle & Foot Care, we have helped many people throughout the Central Florida Area improve the appearance of their nails. Using a state-of-the-art laser with one less than 30 minute treatment, we can decrease the pathogens that cause toenail fungus infection (Onychomycosis). The treatment is safe and painless without heat damage to the delicate nail bed tissue. 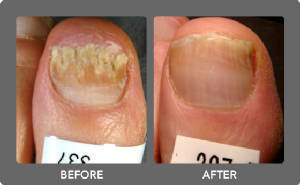 All patients are given all of the treatment options for the nail fungus. We work with patients on what is the best and most affordable treatment option that may yield positive outcomes. You may need several laser sessions inorder to have your nails improve in appearance and often we will add a prescription either topical or oral to help kill the fungus. 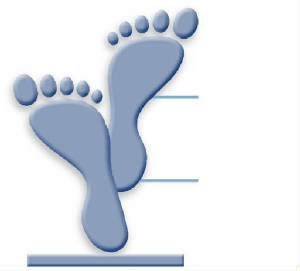 The Center for Ankle & Foot Care treats nail fungus. Our Doctors are foot specialists who know the anatomy of the nail and how to truly treat a fungal infection using the state of the art PinPointe Laser™for the treatment of toenail fungus, which is the safest and most effective way to improve the appearance of your nails. ThePinPointe Laser™ is done in the office and is effective, FDA approved, painless and carries no side effects. 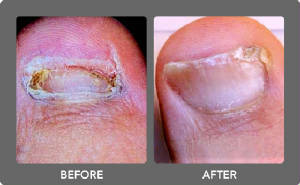 Cosmetic laser toenail fungus treatmentat the Center for Ankle and Foot Care can change your appearance. Patients travel from all over for our doctors to perform theirlaser toenail fungus removal procedure. 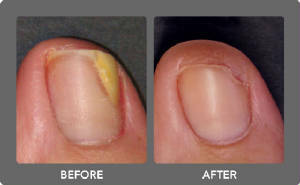 What is the PinPointe Laser for Nail Fungus?